Azania Travel understands the importance of going on vacation. Whether a quick getaway to the Caribbean, family vacations, cruises, European vacations, or African Safaris, we will help ensure your vacation more than meets expectations. Now your vacation can be exactly what you want it to be, fun!—without all the planning and logistics hassles. With Monograms, we handle all the details, so you can feel comfortable and confident in your destination—even if it's your first time there. On a Monograms independent vacation, we'll help you feel right at home in your destination—even if it's your first time visiting there! Before you leave, you'll receive a Trip Planner complete with key information. Then, once you arrive at your destination, friendly, professional Local Hosts are on hand to provide you with a Destination Guide, to offer hints and recommendations to help you get the lay of the land, and to ensure you have what you need to make the most of your time. With the money you save from booking a Cosmos vacation, you'll have plenty left over to spend on the trip - from theater tickets to spontaneous adventures. For more than 45 years, Cosmos has created exceptionally affordable travel packages for the savvy, value-minded traveler. And with the nearly 90 journeys throughout the United States, Canada and Europe, there are so many opportunities for you to explore the world independently - all at an unbeatable price. We build free time into every Cosmos vacation, so you can eat, shop, and explore the way you want. Whether you’re into art, music, food, wine, history, or whatever, we give you the freedom to truly personalize your trip with optional excursions that are meaningful to you. We love to travel just as much as our clients. 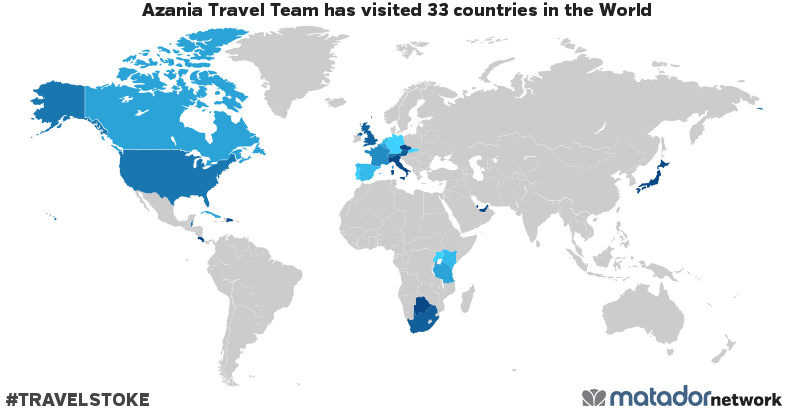 Check out the map and see some of the places we've traveled throughout the world. Azania Travel Team has been to: United Arab Emirates, Anguilla, Netherlands Antilles, Austria, Aruba, Belgium, Botswana, Belize, Canada, Switzerland, Costa Rica, Cuba, Curacao, Czech Republic, Germany, Dominican Republic, Spain, France, United Kingdom, Italy, Japan, Kenya, Luxembourg, Netherlands, Portugal, Qatar, Slovakia, Sint Maarten, Tanzania, Uganda, United States, Vatican, South Africa.